The 7 Habits of Highly Effective People, first published in 1989, is a business and self-help book written by Stephen Covey. Covey presents an approach to being effective in attaining goals by aligning oneself to what he calls "true north" principles based on a character ethic that he presents as universal and timeless. 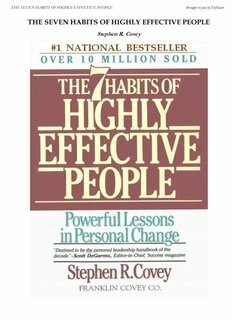 Covey's best-known book, it has sold more than 25 million copies worldwide since its first publication. The audio version became the first non-fiction audio-book in U.S. publishing history to sell more than one million copies. Covey argues against what he calls "the personality ethic", that he sees as prevalent in many modern self-help books. He promotes what he labels "the character ethic": aligning one's values with so-called universal and timeless principles. In doing this, Covey is deliberately and mindfully separating principles and values. He sees principles as external natural laws, while values remain internal and subjective. Our values govern our behavior, while principles ultimately determine the consequences. Covey presents his teachings in a series of habits, manifesting as a progression from dependence through independence on to interdependence.